Sometimes it’s too easy to take for granted the things around you — like the lake down the street, or the concert hall the next town over. For me, it’s been my proximity to the nation’s capital that I often fail to appreciate. While I grew up only 30 minutes away from Washington, D.C., I hardly visited as a child and generally I had no interest to do so. Now at school, I am only 10 minutes away from the city and still take for granted the fact that I am within spitting distance of one of the most historically significant and politically powerful cities in the world. In an attempt to rectify my apathy, I have made an effort to spend more time in D.C. The summer after returned from Madrid, I took off every Wednesday from work and rode the metro in the city. I walked around alone, took pictures tourist-style and visited nearly every Smithsonian museum (must take advantage of the freebies!). But that’s only the tip of the ice burg. There’s so much more to D.C. that I need to consume before I graduate and move abroad, and slowly but surely, I’ll do my best to soak in all that this mighty city has to offer. 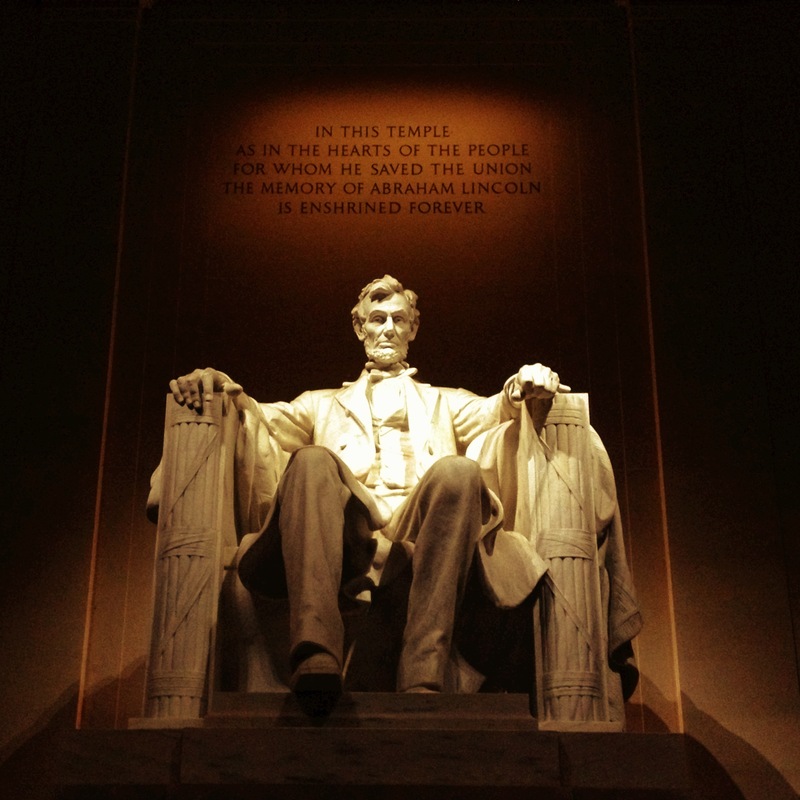 Aside from the museums, the most historically compelling attractions in D.C. are the monuments and memorials. While there are what seems like a never-ending list of memorials in the capital city, there are 11 that stand out from the rest: the Washington Monument, Lincoln Memorial, Jefferson Memorial, Martin Luther King, Jr. Memorial, World War II Memorial, Vietnam Veterans Memorial, Vietnam Women’s Memorial, Franklin Delano Roosevelt Memorial, Korean War Veterans Memorial, Marine Corps War Memorial and Pentagon Memorial. Last weekend’s warm weather compelled a friend and I to walk around the city and explore some of the memorials we had yet to visit. We had no set plan for where we would go; we just decided to see where the adventure would take us. Beginning our journey on the National Mall, we headed away from the Capitol building and down toward the Washington Monument. The monument has been under repair since an earthquake and hurricane in 2011 caused substantial damage to its foundation. 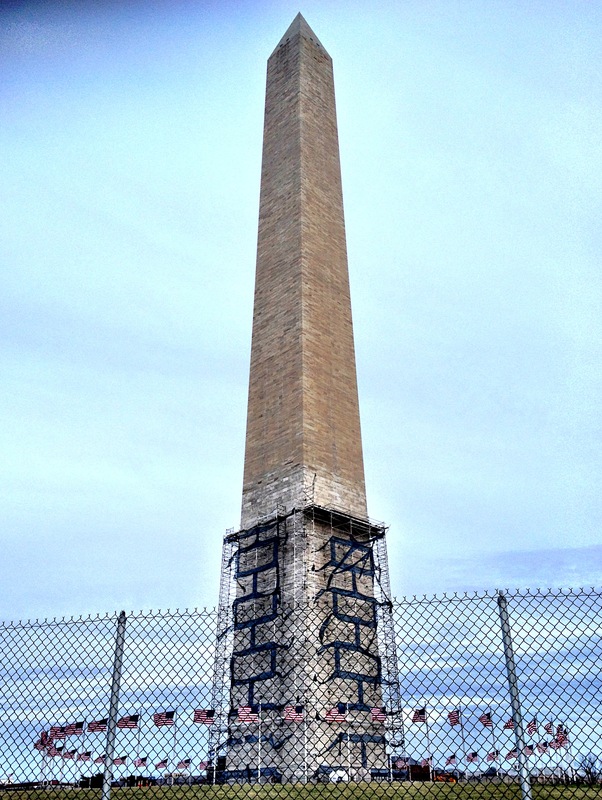 Under normal conditions, patrons would have the opportunity to enter the 555-foot obelisk, an homage to President George Washington and the world’s tallest structure made of stone, and take a tour to the observation deck. But we could only walk by, taking pictures as we headed down the Mall toward the World War II Memorial. I’m embarrassed that I’ve lived so close to D.C. for so long and never visited the WWII Memorial until now. As we approached the stunning arches protruding from the rest of the memorial’s columns, I was overwhelmed by the serene beauty of the structure. The memorial is centered on a memorial plaza and Rainbow Pool. 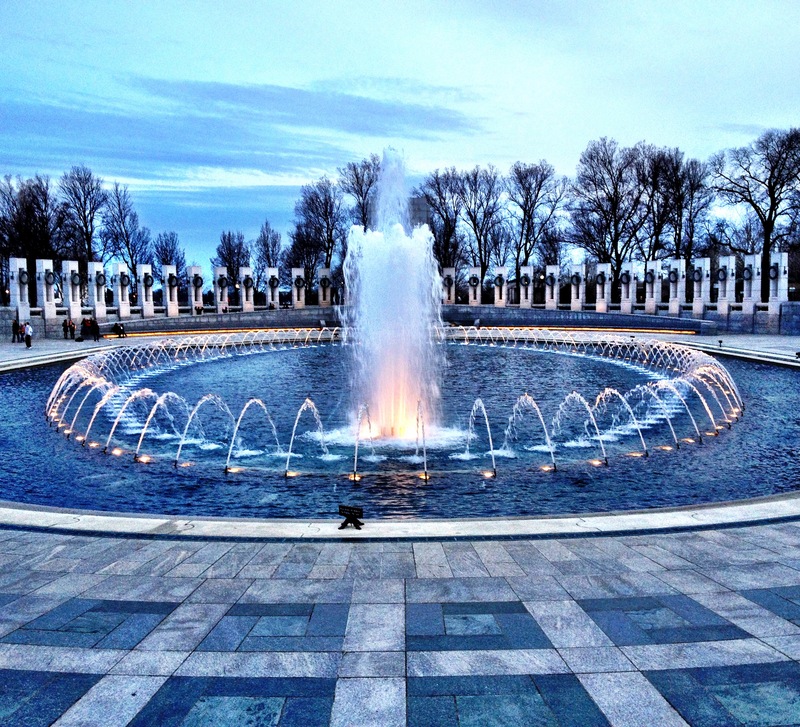 The pool features small jets that gloriously move and shoot water to create a beautiful fountain, a unifying feature for all other elements of the memorial. Around the plaza stand 56 granite columns that represent the 48 states, seven federal territories and the District of Columbia. The columns are all inscribed with the name of the state or territory and adorned with oak and wheat bronze. They are arranged in the order of entry into the Union, alternating south to north across the plaza. A bronze sculpted rope connects the columns and symbolizes the unification of the nation. I’ve visited the Lincoln Memorial once before on a school trip. I remembered very little of it other than the large columns surrounding the very stoic sculpture of President Abraham Lincoln. Turns out, not much has changed. After leaving the WWII Memorial, we raced down the sidewalk of the reflection pool to get a glimpse of the sunset before it faded behind the memorial. We lost in the race against the clock, but the sky was still bright enough to perfectly illuminate the memorial as we made our assent up its painfully long flight of stairs. 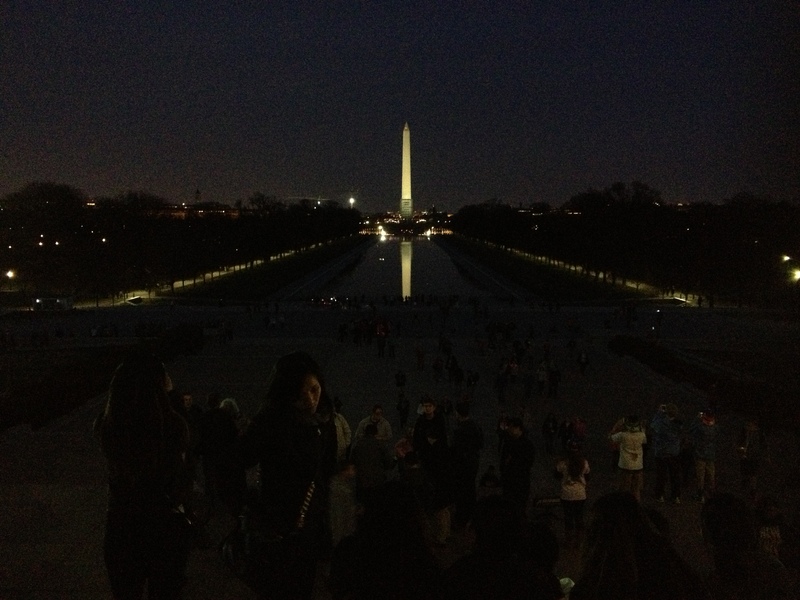 Tired from the walk, we stopped to rest at the foot of the memorial’s stairs and look out over the reflection pool. The water refracted the light from the Washington Monument and the surrounding buildings along the Mall. We watched as the sky turned from deep blue to black, and used the time to do some reflecting ourselves. Looking over the pool gave us such a gentile, peaceful feeling. It was at this moment that I thought again about how much I take for granted. This beautiful memorial and enchanting pool sit practically in my backyard and I have never appreciated it to the extent that I should. We both agreed we could have sat there the rest of the night, but we wanted to move on to a couple more memorials before we headed back home. It took us about 15 minutes to walk from the pool to the Martin Luther King, Jr. Memorial. I had recently visited the memorial to write a 20-page paper about its symbolism for a visual rhetoric course I took over the winter. The memorial is one of the newest in D.C. and is one of the only memorials dedicated to a person who was not a U.S. president. The features of the memorial work together to develop themes of progress and perseverance, and give a notion of forward movement, while the memorial itself remains steadfast. That boulder, representing the stone of hope, features an unfinished sculpture of King himself protruding from front. His feet are undefined and his arms are crossed, one hand holding an unidentifiable scroll. His presence is almighty and his countenance fierce, an evocation to the public to carry out his unfinished business and proceed in the fight for justice, equality, democracy, peace and love. A granite inscription wall encompasses the memorial and displays 16 of King’s most influential quotes. The wall faces the Tidal Basin, an elegant body of water southwest of the National Mall, and leads visitors toward the water. After taking time to read the quotes and talk about their powerful messages, we set out on one of the pathways around the basin and walked around the water’s edge. By then, it was completely dark. 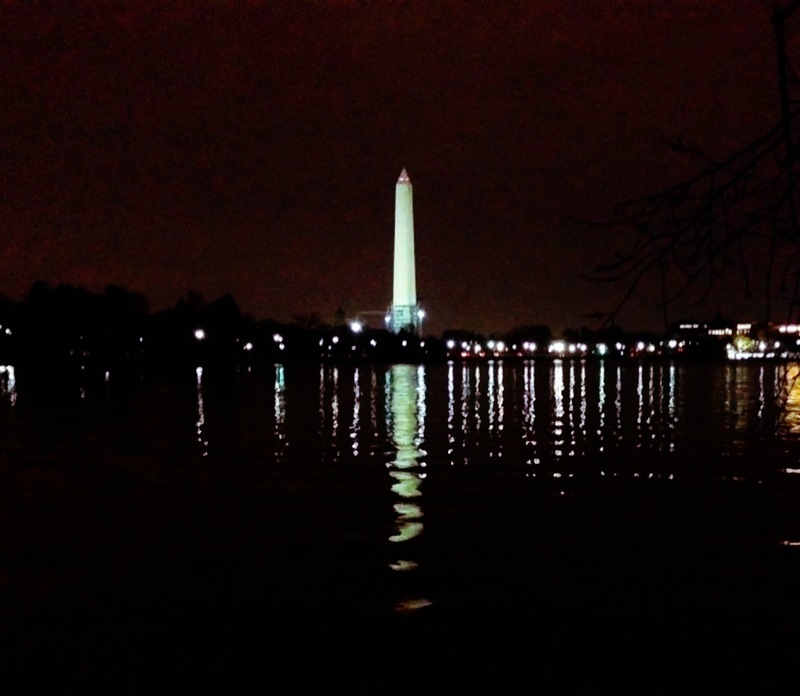 The Washington Monument was more illuminated than ever and we could see its reflection in the basin. We stopped again to rest at a bench along the water and absorb the serenity of the night. 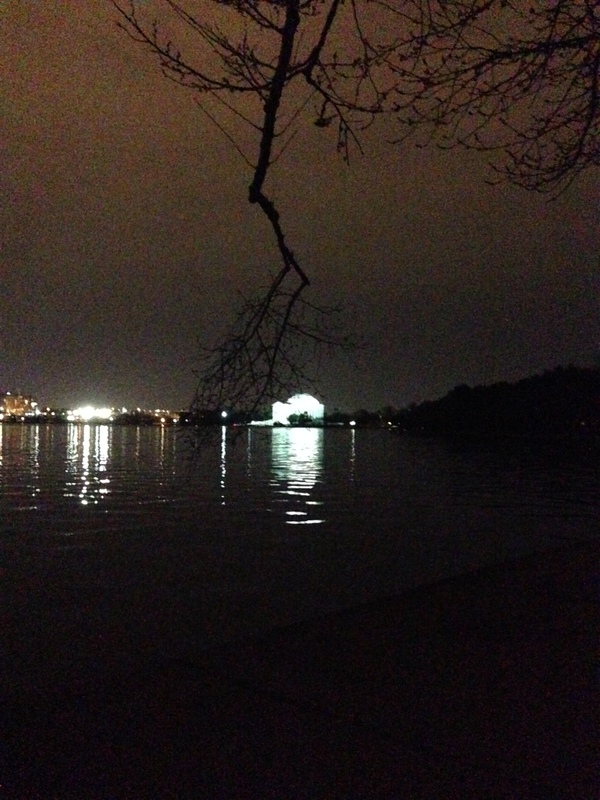 Across the water we could see the Jefferson Memorial, our next and final stop, lit like the North Star. Groups of children and chaperones on school trips passed us by as we sat and talked quietly on the bench. A few more people walk by, including a man on the phone talking animatedly and few couples holding hands. I remember saying, “I would be in such good shape if I lived around here because I would jog around the basin for every day.” That’s probably very untrue, but it’s the thought that counts. The cool air and light breeze finally made us cold enough that we figured we needed to get moving to the next stop. We had one more memorial to hit before our journey could end. 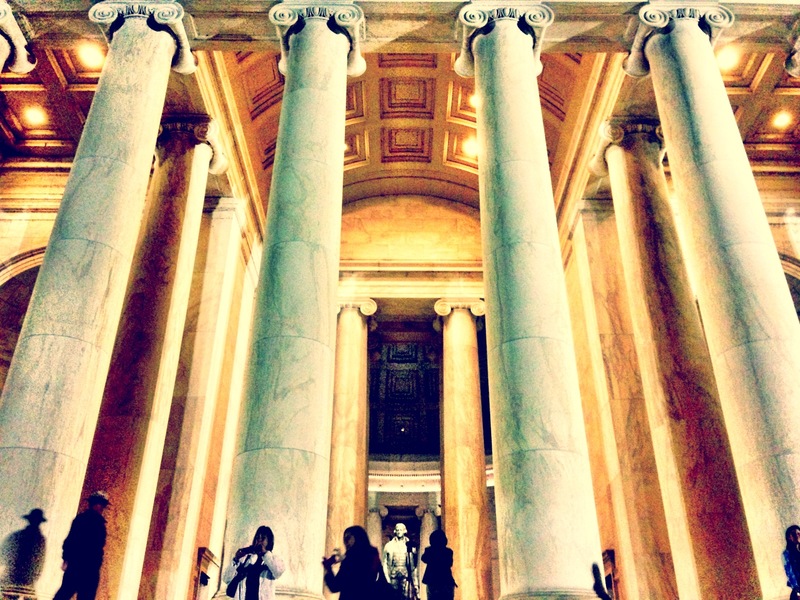 The pathway around the Tidal Basin brought us directly to the Jefferson Memorial. Much like I am with the WWII memorial, I am embarrassed that I had never visited the site before. 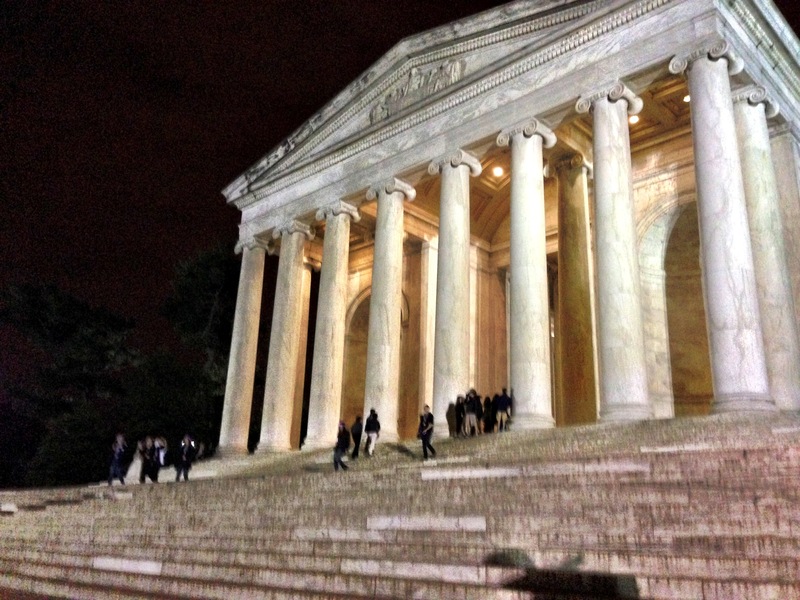 With a columned entrance like that of the Lincoln memorial, the Jefferson memorial creates a chamber around a statue of President Thomas Jefferson, one of America’s Founding Fathers, the drafter of the Declaration of Independence and an adviser to the Constitution. Round steps lead up to the columns of the memorial, and a dome confidently adorns the top of the building. 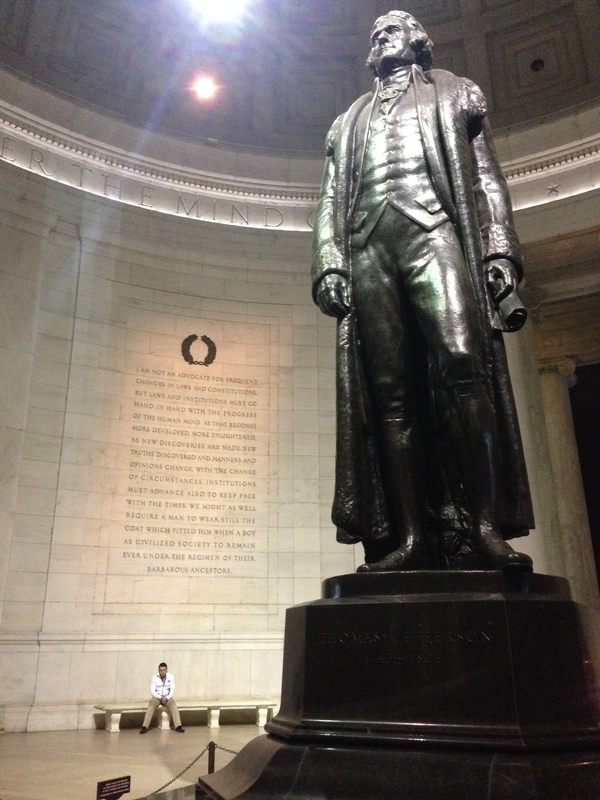 Inside, the 19-foot bronze statue of Jefferson stands central to four surrounding walls. Each wall contains a 17-line quote from one of Jefferson’s most famous works, including an excerpt from the Declaration of Independence. The memorial is simple and neat, and rightfully reflects the impact of the man it honors. When we first arrived, there was a group of at least 100 school children running around the memorial. But they soon left along with the other visitors, and at one point, we had the entire memorial to ourselves. It was relaxing to sit down at one of the four benches along the inscription walls and read the words from one of the greatest minds in our nation’s history. It’s crazy to think how one individual, whether its Thomas Jefferson, Abraham Lincoln, Martin Luther King Jr., or so on, can personally shape the story of the U.S.
By the time we left the Jefferson Memorial, we were hungry and ready to head back home. 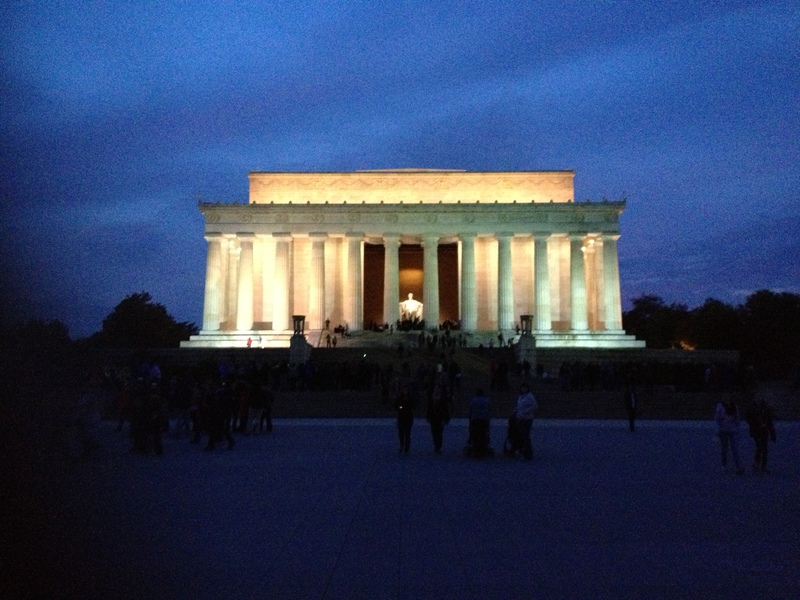 It had been a spectacular evening of playing tourist in our own backyard. 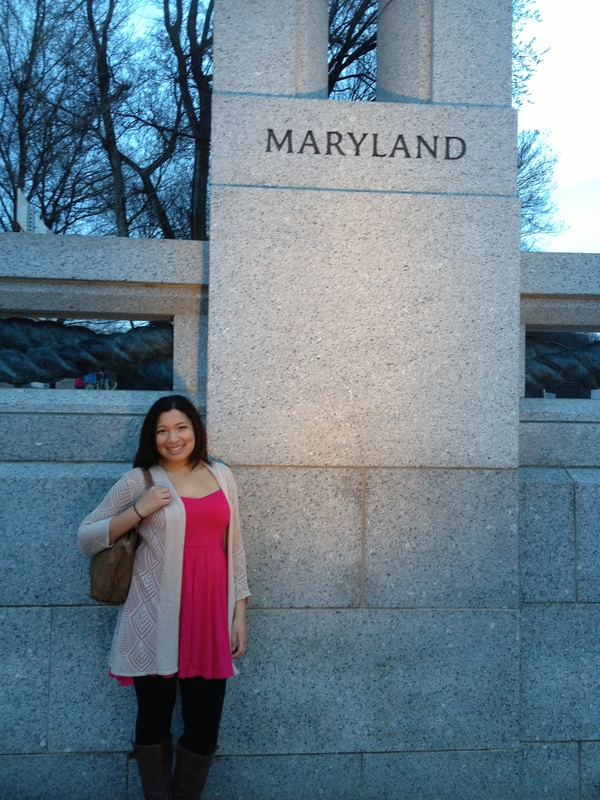 We visited only five of the 11 notable memorials in D.C., but I’m sure we’ll go back and visit them soon. We also have the Constitution Gardens and other spectacular attractions on our list. The weather is getting nicer and summer is approaching, so now we have even more reasons to go explore the nation’s capital. Like I said earlier, slowly but surely I’ll do my best to take advantage of the amazing city that is so accessible to me and just out of reach for so many others. Before I graduate and go to places I’ve never been before, I need to know where I’m coming from. Next Post National Cherry Blossom Festival in Washington D.C.